Former mayor of Curitiba, Jaime Lerner is a city evangelist. For Lerner, the city is not a problem; it’s a solution. An architect and urban planner by training, he brought many innovative strategies to his Brazilian hometown of Curitiba during his terms as mayor (1971–75, 1979–84 and 1989–92). 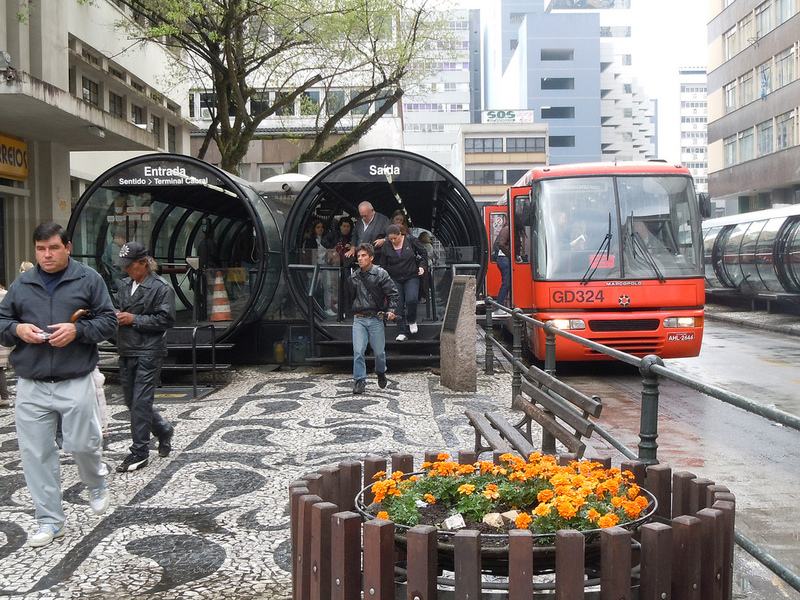 The now famous bus rapid transport system (BRT) was first introduced in Curitiba in the 1970s – today it is found in 83 cities. BRT is a simple strategy to increase the flow and function of bus transport: by introducing boarding tubes, buses function more like the subway, wherein customers pay before entering the tube. Separate lanes are a common function (but not required). This system is particularly viable in rapidly growing/ industrializing cities that lack a clearly defined centre or wherein population booms may shift to different parts of a city. Building a subway is expensive and time-consuming; however a BRT system can be transferred to other parts of the city as needed at a lower cost. According to Lerner, “Creativity starts when you cut a zero from your budget.” A focus on education was also emphasized, in particular environmental education. Today, Curitiba (population 1.8 million) has a recycling rate of circa 70% – one of the highest in the world. The importance of recycling was incorporated for children at school who then went home to teach their parents. Similar strategies focused on cleaning up the city: low-income families living in informal settlements with narrow streets (too narrow for a municipal waste removal) could trade garbage bags in for food or school supplies; fishermen were encouraged to supplement their income by cleaning up the waterways. Floodplains were purchased (to discourage informal settlements in dangerous places) and city parks were designed. Because lawnmowers and petrol are expensive, the city invested in ‘municipal sheep’ to mow the pack grasses; the wool sold and the money invested in children’s programmes. Homeless children were also given garden plots to tend to, developing a sense of ownership, identity and pride. Lerner also emphasized the need to develop a multi-use city; sectors that could play different roles over 24 hours, such as a school or museum that turns into a café. Jaime Lerner introduced many creative approaches to address Curitiba’s challenges, providing also an example for like cities in rapidly industrializing countries. A colourful speaker, he appeared on TED (see below) describing three ‘friends’. First, there is Turtle: an excellent example of living and working together. Next, there is Otto, the automobile: he is invited to the party and never leaves; he drinks a lot and has high demands. Finally, there is Accordion, the friendly Swedish bus: he can take several hundred people in one go – 270 Swedes, or 300 Brazilians, according to Lerner. Lerner emphasizes two interconnected issues that cities need to address: mobility & sustainability. Over time, Curitiba has become an example of living and working together – just like the turtle. A major part of this was the introduction of the BRT system. For Lerner, the car is like your mother-in-law, “You have to have a good relationship with her, but she cannot command your life. When the only woman in your life is your mother-in-law, you have a problem…” Sounds like good advice! This design iis spectacular! Youu defvinitely know how to keep a reader amused.